The Centre County Planning and Community Development Office (CCPCDO) is responsible for assisting the property owner, subdivider/developer, citizens, and agencies concerned in subdivision and land development matters. The CCPCDO determines if proposals fall under the jurisdiction of the County's Subdivision and Land Development Ordinance when municipalities have not adopted their own subdivision and land development ordinance. 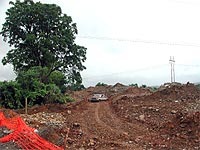 Environmental emphasis has been placed within the scope of the regulations by way of a comprehensive review of development limitations, such as: sewage analysis, soil resources, floodplains, carbonate geology, sloping lands, mine subsidence, sensitive areas (agricultural, mineral, or forested resources), as well as water resources.